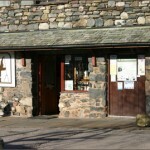 Two people phoned the police to say they were lost on Great Gable. The said they were stuck on a crag overlooking the Wasdale Head Hotel. The Team’s leader made calls to the lost persons and established that they were on the grassy col at the top of Great Hellgate. They were talked back up to the summit and they given bearings to get them back down to Styhead. They were safely back down at 8.00 p.m. when incident closed with no requirement for team members to go out on the fell. Incident started at 17:30. Incident occured at NY 20972 10197 (797m).